Place all of the crust ingredients in a food processor and pulse until the texture is sandy. Adjust the salt to create a slightly salty flavor. Create a ¼ inch pie crust by pressing the dough into a pie pan, making sure to include the edges. Place the crust into the refrigerator for about 20 minutes. Combine all of the filling ingredients except the psyllium husk into a food processor and process until creamy. Adjust the spices to taste, and place into a bowl. 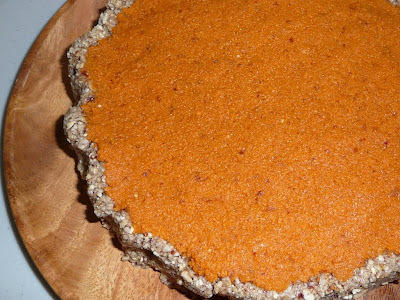 Fold in the psyllium husk with a spatula, and pour the filling into the pie crust, making sure to spread it evenly. Place the pie into the refrigerator for at least 10 minutes, or overnight if a firmer pie is desired. I wonder if the New Zealand kumara would work in place of yams in this recipe. I know of yams/sweet potatoes because I was raised in the USA, but I don't think I can remember what they looked like in their raw state. The kumara here in NZ is similar in taste from what I can remember, so I wonder if it will work. I guess I'll just have to try it :-) I love sweet potato pie! Thanks for sharing the nice recipe.